Cosmic microwave radiation points to invisible ‘dark matter’, marking the spot where jets of material travel at near light speed, according to an international team of astronomers. Lead author Rupert Allison of Oxford University presented their results yesterday (6 July) at the National Astronomy Meeting in Venue Cymru, Llandudno, Wales. Currently, no one knows for sure what dark matter is made of, but it accounts for about 26% of the energy content of the Universe, with massive galaxies forming in dense regions of dark matter. Although invisible, dark matter shows up through its gravitational effect – a big blob of dark matter pulls in normal matter (like electrons, protons and neutrons) through its own gravity, eventually packing together to create stars and entire galaxies. Many of the largest of these are ‘active’ galaxies with supermassive black holes in their cores. Some of the gas falling towards the black holes is ejected out as jets of particles and radiation. Observations made with radio telescopes show that these jets often stretch for millions of light years from their host galaxy – far larger in extent than the galaxy itself. Scientists therefore expected that the jets would live in regions where there was an excess, higher-than-average concentration of dark matter. But since dark matter is invisible, testing this idea is not straightforward. Einstein’s general theory of relativity describes how light feels the effect of gravitational fields, giving away the presence of dark matter through an effect known as ‘gravitational lensing’. Observing how dark matter distorts light allows astronomers to deduce its location and measure its mass. The Universe also has an ideal reference map – the Cosmic Microwave Background (CMB) – covering the entire sky. This is a relic of the formation of the cosmos, and is a ‘snapshot’ of the universe as it was just 400,000 years after the Big Bang. The light from this epoch has taken more than 13 billion years to reach us. Light coming from this very early time travels through most of the universe unimpeded. The lumpy dark matter, however, exerts a small gravitational tug on the light, deflecting it slightly from a straight-line path, rather like a lens does in a pair of glasses. By analysing subtle distortions in the CMB, the team of Mr Allison, Dr Sam Lindsay (Oxford) and Dr Blake Sherwin (UC Berkeley) were able to locate dense regions of dark matter. As suspected, this is where the powerful radio jets are more common – a deep-lying correlation between the most massive galaxies today and the afterglow of the Big Bang. 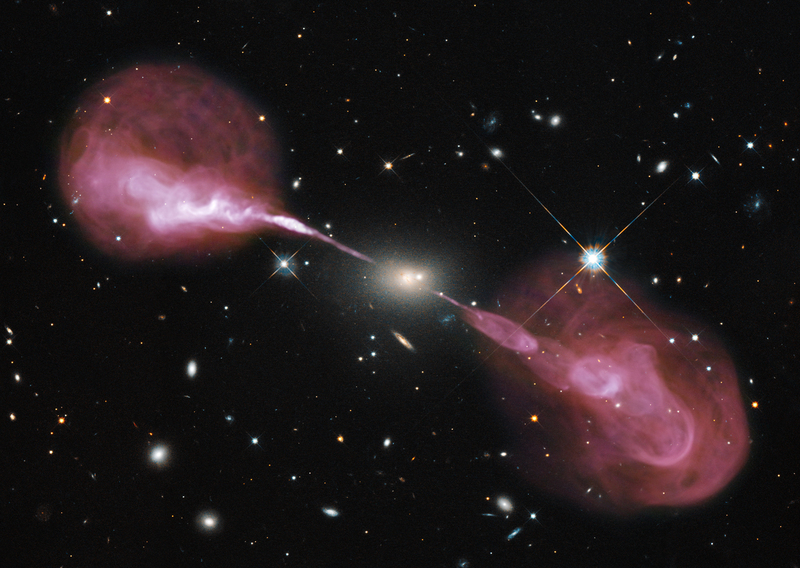 The scientists now hope to use new instruments to improve their measurements and more clearly understand how radio jets and their host galaxies change over the history of the Universe. Future telescopes such as Advanced ACTPol and the Square Kilometre Array will provide the complementary data to make this hope a reality. The researchers are part of a collaboration of scientists working on the Atacama Cosmology Telescope high in the Atacama Desert in Northern Chile. They measured the lensing effect of dark matter on the Cosmic Microwave Background, and compared this to the positions of radio jets found using the Very Large Array radio telescope in New Mexico, USA.